When we established Earthborn over a decade ago we were committed to bringing to market a true eco alternative to conventional paints. Our commitment to paints which are gentle on the environment and healthier to live with has never wavered. 1.Look for the EU Ecolabel. The Ecolabel is unique because it is truly independent of any profit making organisation and not an accreditation that can be ‘bought’. 2.Look for a list of ingredients on the tin. We are proud to list the ingredients because we know exactly what has gone in to every tin. Earthborn was the first paint brand in the UK to be licensed to carry the EU Ecolabel. But what does it mean and why are we so proud of this achievement? There are various accreditations available but the Ecolabel is unique because it is truly independent of any profit making organisation and not an accreditation that can be ‘bought’. It provides independent, third party assurance that the product meets the highest possible environmental performance and is the only environmental product certification scheme that is accepted EU wide. In turn, by carrying the EU Ecolabel our paints comply with the criteria of SKA Rating, a system launched by The Royal Institution of Chartered Surveyors (RICS) for rating the environmental impact of retail and office fit-outs in the UK. SKA Rating comprises good practice measures across energy and CO2, waste, water, pollution, transport, materials and wellbeing. Depending on the number of measures achieved, and the significance of these from a sustainability perspective, a fit-out can earn a gold, silver or bronze SKA ranking. Take a look at our Case Study to see how Earthborn paints contributed to cosmetics brand Lush achieving a gold SKA Rating in their shops. Next time you are looking for a true ‘Eco’ paint, look out for the EU Ecolabel flower symbol. 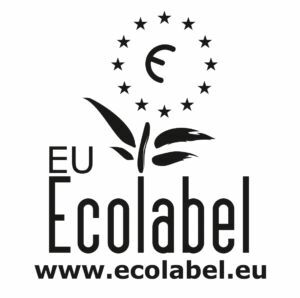 For more information on the EU Ecolabel please click here.